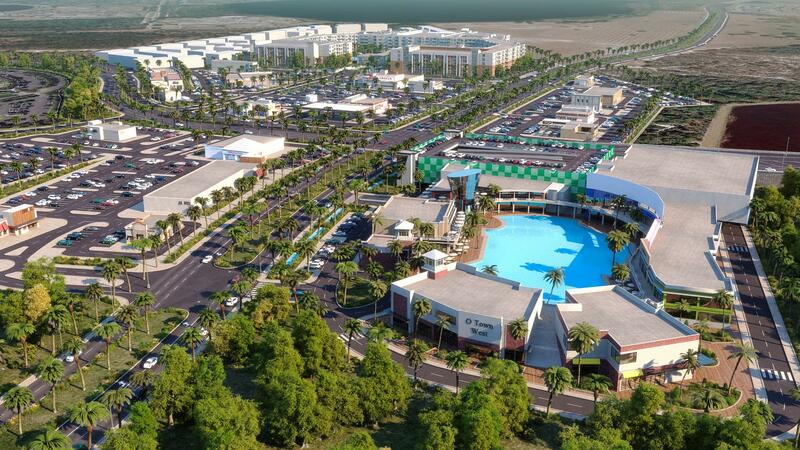 The developer responsible for the Dr. Phillips Dellagio and the I-Drive 360 development known for the Coca-Cola Orlando Eye — as well as other projects mixing residences and shops in Winter Park, Dr. Phillips, Lake Nona and Lake Mary — is working on his biggest project yet. 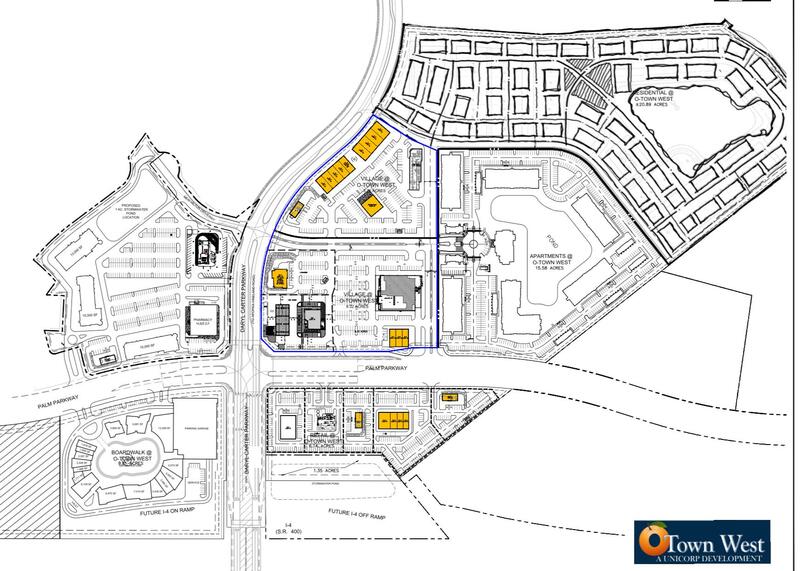 The Otown West overall development now consist of 6 individual projects with 4 retail centers consisting of over 500,000 sf of space, 800 multi-family units and 200 single family units. “We’re trying to create a whole place. We’re trying to create a complete sense of place with dining, entertainment, shopping and living,” Whittall said. The various aspects of the project would be branded with the O-Town West name. With a history of launching projects with a signature feature, Whittall said O-Town West would include a boardwalk with shops and restaurants offering outdoor experiences and overlooking a body of water with “water shows” featuring jet fountains and lights throughout the day. He likened the entertainment to a former Orlando attraction called Dancing Waters. “The boardwalk will be very cool,” he said. The O-Town Village part of the project would include jogging trails, a dog park, apartments and single-family houses starting in the $500,000 range, he added. It would also be centered on a clear-lagoon style water body for residents’ use. To get real time news updates from the Southwest Orlando community, text drphillips to 41411 on your smartphone. Exactly where in Dr. Phillips is this going to be built? I’m interested in getting updates on this project. Whats the name of the developer? Way too much traffic for the area….please leave our town as it is! Modern firms who provide details for BMW and MINI need be firms with large experience in these sphere. If you wish to search firm who allow only original details for BMW, best way to search firm with good reputation. Such a firm may be [url=http://jados.lt/]mini dalys[/url] firm, who presented auto parts for bmw and mini. At jados.lt there are a lot of parts for different BMW models. Ogranization is based in Vilnius and sell original parts for german cars and details for other autos. They have their own magazine in Vilnius, two magazines in Krakow and one in Germany. At their own stock they have any of auto parts for cars repairing. At link you could as rule search parts for cars, like as BMW or Mini. You may also call for them and ask them about details at phone number +37061018688. Every week more and more parts for cars are bought with the support of Internet. In the Internet you can find different virtual stocks. There you could search and buy different car details. Original details for BMW ordered only after prepayment. Jados “jados.lt” firm have only real and certificated details. They have various details for MINI. Organization suggest for all people opportunity to buy parts with guarantee. Managers also have their own technical support. If you wish to ask them about help, they suggest for your different ways solution of the problem. You could also use their form at website and search spare parts at VIN. Find by brand of car is also possible. If you wish to make appraisal for your car, you could ask managers. They help you and suggest different decisions. For example, you could go to service, where specialists will diagnose your auto. You can also search and get spare parts for various models BMW in company. You could use different ways of buying. For example, details searching for BMW is carried out: by VIN, by form of auto, by article. To pay for your booking for details for cars you could: in organization, with money in office, with bank card, with money at bank, use banking service and make banking transfer in various region. Firm also have their own courier serve. Courier managers should send you spare parts with international post if you leave in foreign country or do delivery at Vilnius. Details delivery may be also for Kiev, Tver, Moscow, Saint Petersburg and other cities. Administrators who are working at organization support you with choice and suggest your different ways if you desire to purchase spare parts for cars. You should also search at link characteristics for spare parts and their photos. Жми на скрин чтоб повидать всю красоту данной спелой мамочки!! !